Chinatown Dining Week is in full swing, on until January 28, 2018. 5 restaurants are offering 2-course, $15 dinner specials this week – check out the menus. Love Pizza is celebrating their second birthday downtown on January 28, 2018 with a buy one-get one special that day! Even better, $1 from each pizza will be donated to the Bissell Centre! Food4Good’s first affordable Fruit & Veggie Sale of the year is taking place on January 30, 2018 at the Glenwood Community League. Winefest Edmonton is back on February 16-17, 2018 at the Shaw Conference Centre. Bodega’s third location in the former Dish and Runaway Spoon at 12417 Stony Plain Road opens on January 26, 2018. New coffee shops are popping up all over the city – The Mudpie Cafe is among them, located at 14238 85 Avenue, adjacent to the child-friendly MudPie Playhouse. It looks like Watari is opening up a second location on Jasper Avenue and 105 Street, to focus on more quick-serve items. East Coast restaurant Atlantic Trap and Gill will be closing on March 29, 2018. Andrea discovered at The Moth that plant-based cuisine can be good. On the same front, Liane wrote a feature on southside vegetarian restaurant Good Stock. Leduc checked out the fresh doughnuts at Ohana Donuterie. Crystal reviewed both Revel and Black Bull Kitchen & Bar. Graham is the latest to rave about the sausages at Salz. Jonny hit up T & D Noodle House in the Alberta Avenue neighbourhood. The Mexican flavours at La Patrona are worth the trek out to Sherwood Park, says Vue Weekly. Also from Vue Weekly, they rounded up 5 of their must-try spots that opened in 2017. 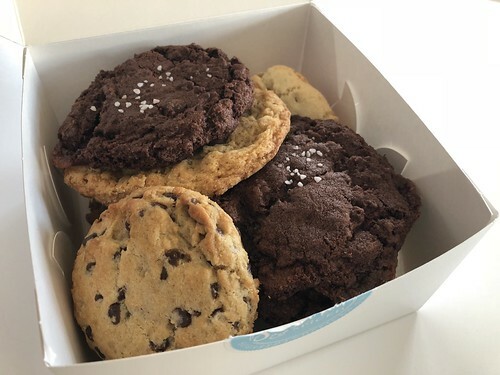 Great piece from Liane about how local restaurants have embraced food delivery apps. CBC also discussed this movement with Chef Eric Hanson from Prairie Noodle Shop. Chef Paul Shufelt hopes a trend he noted about poor and indifferent service is discontinued in the local food scene. The Local Good has begun a Restaurants of YEG series. The first to be profiled is Cafe Linnea. It’s always great to see local representatives on food competition shows, and even better when they happen to be kids! 12 year old Alex Czajka is currently featured on the Food Network’s Kids Baking Championship as the only Canadian competitor. Jacek Chocolate Couture is launching a new look (and some new flavours!) for their artisan chocolate bar line on January 26, 2018. The Globe & Mail offers up some predictions for the Alberta food scene in 2018. 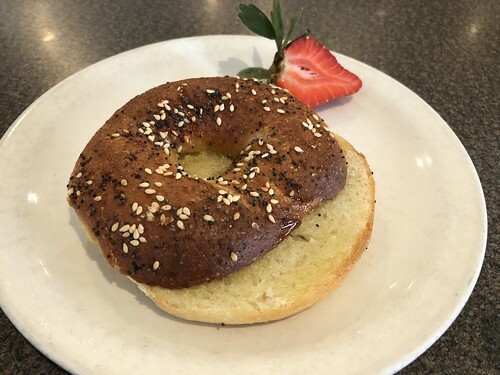 I only stopped in for a bagel at the Rooster Cafe & Kitchen last week, but the service was excellent enough to bring me back for a full meal. The bagel was pretty good too, freshly baked from dough the cafe has shipped in from Toronto. I finally picked up my Alberta BoostR reward from supporting a crowdfunding campaign initiated by Sugared & Spiced last year to open their storefront. It was a hard job eating all of those cookies, but someone had to do it (the Girls’ Night In cookie is still my favourite). 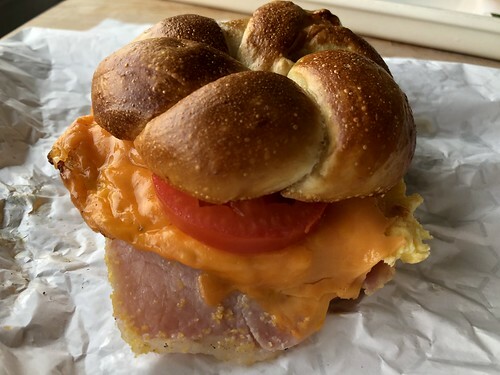 Mack and I have been meaning to try the sandwich side of the menu at Zwick’s Pretzels for some time, and finally had the chance to do so over the weekend. The bacon & egg sandwich (with house-cured back bacon and of course, a house-made pretzel bun) was everything I was hoping for and more.